Our Chairman Shri. V.K. 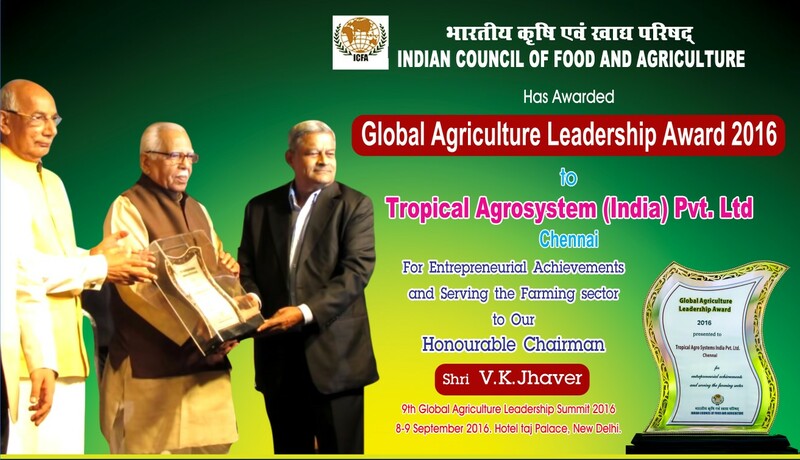 Jhaver has been awarded the coveted “Entrepreneur of the Year-2016” award, at the 9 th Global Agriculture Leadership Summit, held at Hotel Taj Palace, New Delhi, on September 8, 2016. He collected this prestigious award on behalf of our company, presented by the Indian Council of Food and Agriculture, an apex platform for policy work, agri-business trade facilitation and promoting partnerships in agriculture. This award was in recognition of our company’s stellar and wide ranging contribution to organic farming in the field of bio-fertilizers. The award which is presented annually to those individuals/organisations for outstanding contribution, was chosen among many applicants by an eminent panel of experts headed by Prof. M.S. Swaminathan, the father of “Green Revolution” in India, country’s UNESCO Chair on Eco-technology and the first World Food Prize Laurate. Our President Shri. G. Mohan Kumar receiving the “Institute of Excellence Award 2016”, on February 20, 2017,at the Second National Youth Convention on Agricultural Innovations in Sustainable Food Systems for Improving Rural Livelihood jointly sponsored by Indian Council of Agricultural Research (ICAR), University of Agricultural Sciences, Raichur (Karnataka) and All India Agricultural Students Association (AIASA). This coveted award was presented to Tropical Agrosystems for its outstanding contribution in producing biological products for effective nutrient and pest management in agriculture thus providing multitude of job opportunities to farm youth in the country.